Once your seedlings have filled the modules or pots with roots, they will need some more room to continue to grow strong and healthy. Fill individual 7.5cm (3 inch) pots with Westland John Innes No 1 Young Plant Compost. Make a hole big enough to take the roots of one seedling in each pot using a dibber or pencil. 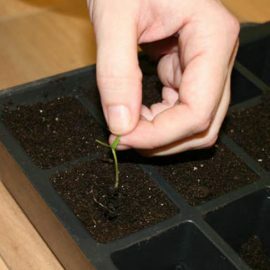 Gently loosen each seedling, pick it up and drop it into the hole, holding onto a leaf and not the delicate stem. Tap the pot to distribute the compost evenly around the roots. Water using a watering can with a fine spray. Keep in a frost-free place until all danger of frost has passed. Water your seedlings and feed then regularly with Gro-Sure All Purpose Plant Food or Gro-Sure Ericaceous Plant Food (for acid loving plants). This will support their early spring growth and will ensure they have the best possible start.